As the popularity of hybrids has grown over the last few years, advocates for the blind have been raising a red flag about noise, or — more to the point — the lack of it. Because electric-drive vehicles emit much lower levels of sound on the street, blind pedestrians who’ve relied on the noise emitted from traditional vehicles lose a major source of information when navigating the streets and sidewalks. 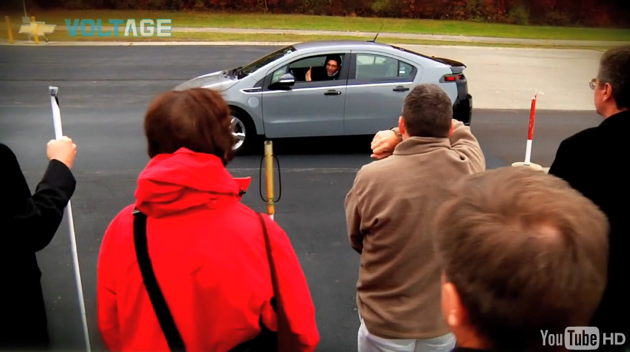 There have been movements in various legislatures to mandate some minimum sound level from electric vehicles to ensure that blind pedestrians can tell when they’re approaching, and General Motors recently conducted a test session at its Milford Proving Grounds with a group of the visually-challenged to assess the audible warning systems on the Chevrolet Volt. The engineers have employed the car’s horn to emit a series of warning chirps when a pedestrian is in proximity to GM’s gas-electric hybrid, evaluating the nature and level of the warnings to alert pedestrians rather than startle them. GM spokesman Rob Peterson tells us that on the first generation Volt the warnings will be manually activated by the driver, although future iterations are likely to incorporate some sort of active system. Currently, the biggest hurdle is developing an active system that can distinguish a pedestrian from another vehicle. Otherwise, without a reliable detection system, the horns would be going off at all times, increasing noise levels and making it largely useless.